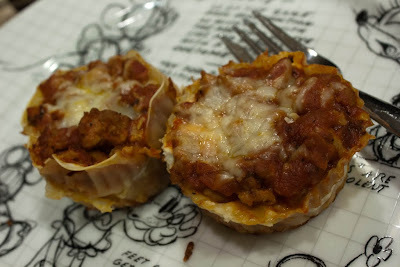 I was reading through my food blogs on Flipboard one night and I found a recipe for these lasagna cupcakes. I modified it a little bit because I have made lasagna quite a few times and I know what I like in it. The original recipe is from Tablespoon.com but I changed it so much that I am going to just re-write it in my own words here. I chose to use gyoza skins instead of wonton ones because they are already round. 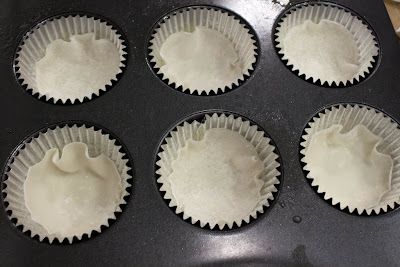 I liked the way they came out when I used them whole but they can also be cut to size to allow you to see the layers a bit better when you take the cupcake out of the liner to serve it. The gyoza skins end up being soft like regular noodles. If you use a whole one, the top layer skin sticks out of the sauce just a little bit and becomes crunchy, just like the edges of a lasagna baked in a 9×13 pan! I used my family’s classic ricotta mix from our lasagna recipe I have been making since I was a kid. The sauce, I kind of made up as I was going along but it is the basic meat sauce I always make really. I love these so much and I am currently dreaming up all the different recipes I can turn in to cupcakes now! To begin, brown the onions and garlic in a little bit of olive oil. While they cook, put the sauce into a medium saucepan. Add the onions and garlic to the sauce and use the same pan to cook the ground turkey. I seasoned the turkey itself with salt and pepper and a little bit of garlic powder as well but you don’t HAVE to do that. Once the turkey is done cooking, add it to the sauce as well. Let the sauce cook while you mix up the ricotta cheese and until you are ready to assemble. I left it for a good hour while I made dessert tonight. The longer it cooks on low, the better it will be. Mix the ricotta, Parmesan, parsley, garlic powder, and salt/pepper in a bowl. Taste it. If it needs more of anything, you can add it now. 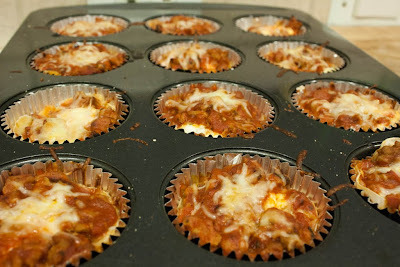 To assemble the lasagna cupcakes, line your cupcake pan with foil cupcake liners. I found these to be much easier clean up than spraying the pan itself and building them that way. Spray the liners with a little bit of cooking spray. Place one gyoza skin in the bottom of each well. Add a tablespoon or so of the meat sauce, then about a teaspoon of ricotta, then a sprinkle of mozzarella. Place another gyoza skin on top of that, then another teaspoon ricotta cheese, a tablespoon of sauce and another sprinkling of mozzarella. 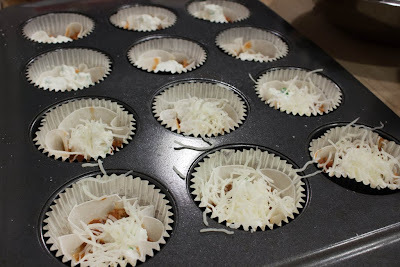 Bake in the oven for 20 minutes, until they are golden on top and bubbly. 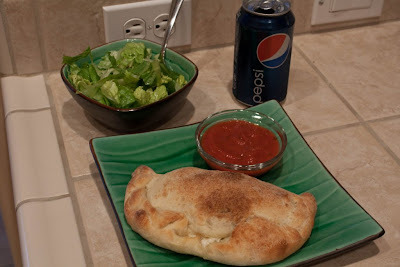 When I got to the last 4, I ran out of ricotta cheese. 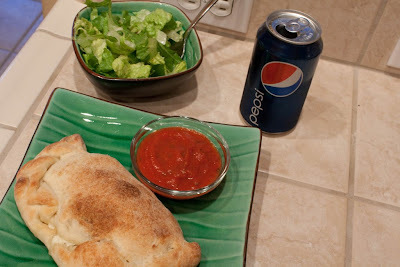 Instead of ricotta, I layered gyoza, meat sauce, pepperoni slice, mozzarella, gyoza, meat sauce, pepperoni, mozzarella. These were a touch smaller than the other ones but still just as tasty! Now for the pictures. I can’t wait to make some more of these to freeze for lunches. It is such a great idea that can be applied to a bunch of different recipes! I might actually do this with shepherd’s pie for tomorrow night’s dinner. Hope you enjoy! 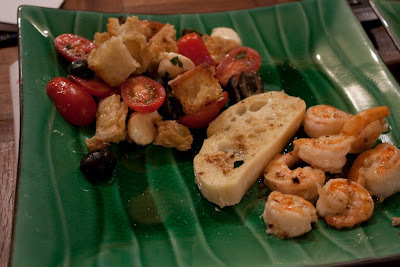 Posted by galadriel07 on March 13, 2012 in General Food, Meals! I decided that since it was a beautiful day out today, I would open all the windows in the house and clean. Once I got started, I ended up wanting to cook a nice dinner as well. The spring air makes me so happy 😀 I made cheeseburgers with animal sauce, caramelized onions, pretzel rolls, and salt and vinegar chips. I was intending to grill the burgers and potatoes but the grill ran out of propane after the potatoes were done. I ended up making those in a cast iron skillet instead. I didn’t really change the recipes that I used for each thing so there aren’t too many comments to make. I saw Bobby Flay make these on a commercial for his grilling show the other day. They were pretty delicious. I made them with Golden Potatoes that were pretty small but I still cut them in coins before I put them on the grill. Pre-boiling them really does make them cook so much faster! Place potatoes in a pot of cold water, add 1 tablespoon of salt and cook for 10 minutes once it starts boiling. Drain, let cool more than I did and slice into 1/4-inch slices. Toss the potato pieces in a little oil, salt and pepper in a mixing bowl. Place them on the grill until they are golden brown and cooked all the way through, about 10 minutes. Take the slices off the grill and move them to a platter in an even layer and immediately drizzle with the vinegar and season with salt. 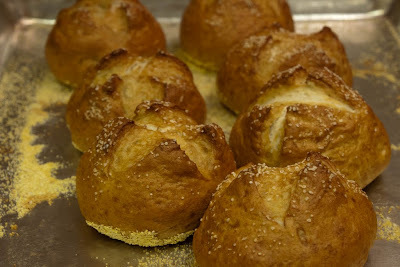 Pretzel Rolls I have made quite a few times and every time, they are amazing. This time was no exception. 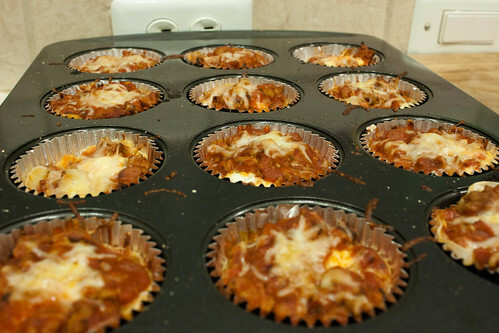 They don’t have a lot of ingredients and they are pretty easy. I use my mixer so my recipe varies a bit from what the original says to do. I got the recipe from Serious Eats, along with the ones for the animal style sauce AND the caramelized onions. I highly recommend Serious Eats whenever I can. 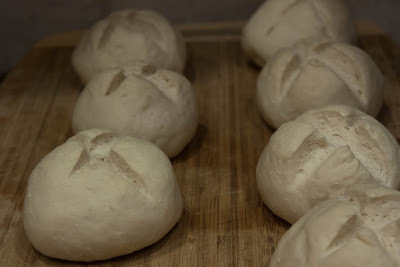 Place the bread flour, instant yeast, kosher salt, and sugar into a mixing bowl and mix with the beater until it is well combined. Swap to the dough hook and stream the water in while the mixer is on low speed. Once all the water is mixed in, set the mixer on 3-4 and let it mix for a few minutes until the dough forms a ball. 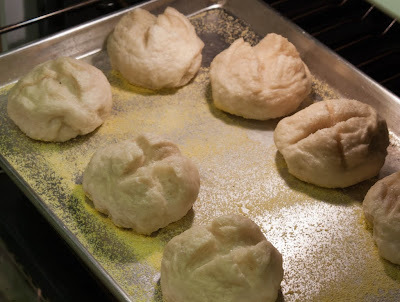 Put the dough ball into a greased bowl and let it double in size (30 minutes or more). 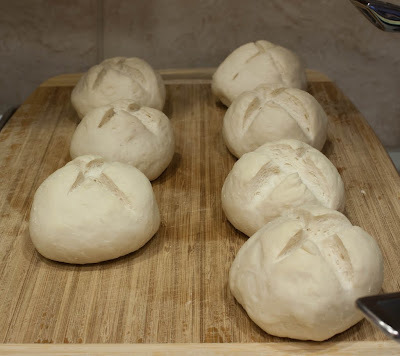 Once doubled in size, punch the dough down and separate it into 8 equal pieces (I ended up with 7 this time) and form each piece into a ball. Slash the tops with an X and let them rise for another 30 minutes. Bake the rolls for 15-20 minutes, until they are golden brown and look like pretzels! 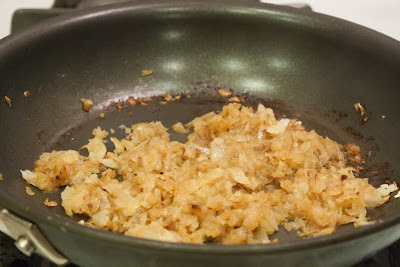 Next up, the caramelized onions! These are part of the Serious Eats spread on how to make an In-n-Out burger at home. I followed the directions for the onions and also for the animal sauce. Heat 1 teaspoon oil in a 10-inch non-stick skillet over medium-high heat until shimmering. Add onions and 1/2 teaspoon salt to skillet. 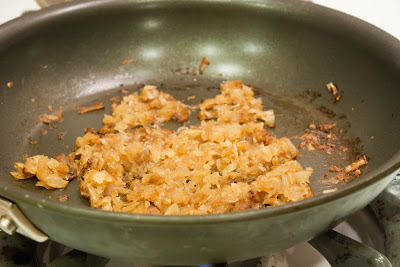 Reduce heat to medium low, and cook, tossing and stirring occasionally until onions are well browned, about 15 minutes. 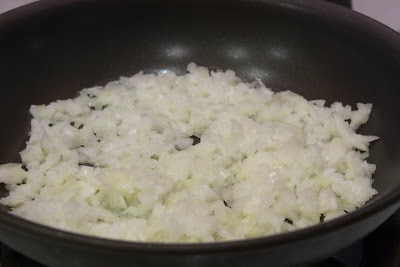 Once onions begin to sizzle heavily and appear dry, add 1 tablespoon water to skillet and stir. 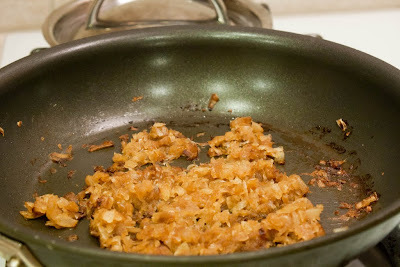 Continue cooking until water evaporates and onions start sizzling again. Repeat process, adding 1 tablespoon of water with each iteration until onions are meltingly soft and dark brown, about 3 times total. Transfer to a small bowl and set aside. Put the mayo, ketchup, relish, sugar and vinegar in a bowl and mix until it is combined. Finally, I made a tomato mozzarella salad with basil, parsley, scallions and vinegar/oil for the dressing. It is something I make in the summer all the time so I thought it would go well with this dinner. This is the recipe I followed originally for it. 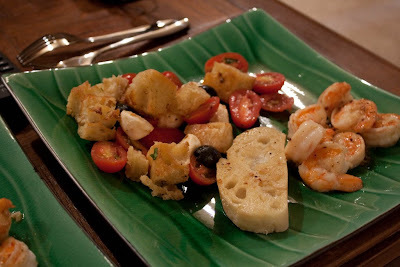 Tomato Mozzarella Salad is based on a caprese salad. I use a pint of regular red grape tomatoes. Unfortunately, it is not the season for tomatoes so these were a little bit too tart. 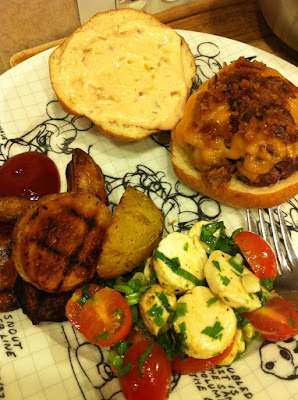 Posted by galadriel07 on March 5, 2012 in Meals! 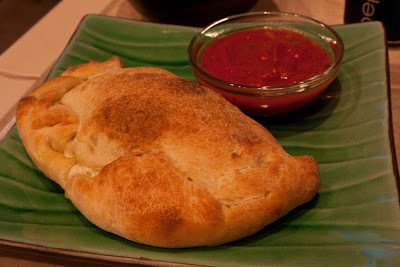 So i bought some pizza dough with the intention of using it for making cheese calzones. I can’t order them at any of the pizza places around town so I thought I should make it myself. I used whole milk ricotta cheese with a little garlic powder, parsley, salt and pepper, and parmesan cheese mixed in. I do it to taste so I don’t have any measurements. I split a pre-made pizza dough into 4 pieces and rolled out 2 of them and saved 2 of them. 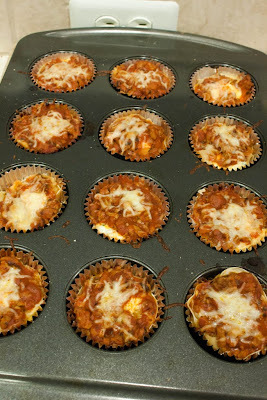 I rolled them thin and put a spoonful of ricotta cheese on each one and put some mozzarella cheese on top of that. I closed them up and baked them at 400F for 15 minutes or until they are golden brown and delicious. 😀 I made a romaine salad with oil and vinegar as a side dish as well. Posted by galadriel07 on September 15, 2009 in General Food, Meals!